I'm a Netflix fanatic, as are most of us now-a-days. I'm obsessed with binge-watching shows that catch my interest and lately, I've been a total foodie when it comes to television. 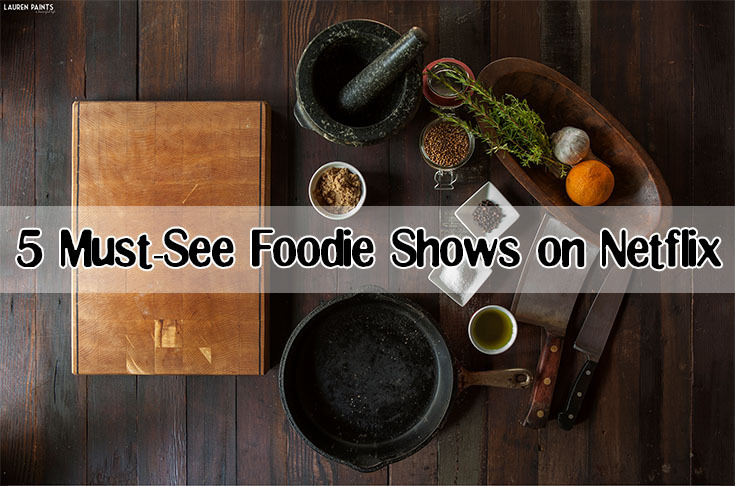 I've been trying to discuss some of these awesome shows with friends lately and I've realized that most of them have no idea Netflix even has such a wide variety of cooking/foodie shows. So go ahead an pull up your queue so we can add every single one of these shows to it! We're going to start off with one of my favorites, although these shows are listed in no particular order. 1. Diners, Drive Ins, and Dives - This show with my main man Guy Fieri has to be one of my favorite shows on Netflix, ever. It makes me want to travel, eat, and just be silly all at the same time! Guy's commentary on the shows and his passion for food are really inspiring and some of the amazing foods he eats are from my area, so that's pretty cool to watch as well! If you are looking for places to stop on a road trip or just looking for foodie traveling destinations, this show is a great way to find hole-in-the-wall places that serve food that will blow your mind! 2. Food Network Star - This super fun show puts you in contact with people who are real, making it a fun way to watch someone who is just a normal person picked to possibly become the next Food Network Star and receive their own tv show. I love watching each of the contestants grow and learning more about food in the process. This show seems like it starts out slow at first but you'll soon fall in love with the contestants! I personally love the judges as well and Giada is an inspiration to me on so many levels. I highly recommend this show for other bloggers as well, it has been helping me learn to describe food in a more appealing way which has been a great educational asset as well. 3. Ace of Cakes Collection - This super fun dessert based show takes you on a journey through Duff Goldman's kitchen, the Ace of Cakes himself. I'm obsessed with all of the creativity in this show and it really inspires me to get my hands dirty, although my one experience with fondant in the past was a total fail... I'll be giving it a try again soon thanks to this show and it's influence over me! 4. The Pioneer Woman - Almost everyone knows of Ree's show, but most people don't know that you can watch 20 episodes of her tv show on Netflix! What I love about Pioneer Woman is that it feels like you are really connecting with Ree, like you are reading her blog or sitting in her kitchen. A personable experience and learning new recipes are how she lures people in and then she hooks you with family stories and her captivating personality! This is one show I highly recommend to anyone even remotely interested in cooking and/or food! 5. Anthony Bourdain: No Reservations - I love this show for every single reason some people hate it. Anthony Bourdain, while he may come off to rude or a know-it-all to some, supplies so much insight into odd culinary experiences that his cynical and sarcastic personality comes off as almost charming in some ways. He's a genius at describing things, when he hasn't had too much to drink, and simply knows how to show a viewer a good time. Now that I've shared some of my recent Netflix foodie favorites, I'd love to know what you've been watching lately?